This definitely would have come in handy during the cold war. I once heard this story of some American ship that would shred its documents, then it would just throw them out into the sea. This was before environmentalists told us it was a big no-no. Anyway, a Russian submarine would pick up these shredded documents, dry them off, then painstakingly put them together to recover top secret information. 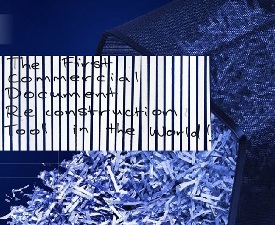 Imagine how easy it would have been if the Soviets had the Unshredder. Well, now you can have it for a rather expensive price of $950 per year for its licensing fee. I wonder if it works with cross cut shredders as well. I say it times for cross cut shredders that shred into 2mmx2mm squares so the average identity thief just moves onto someone who doesn’t have a shredder. Who knows, we may be re-shredding to beat the unshredder. An unshredder would probably have come in handy at that company. Easy way to avoid it, to burn it or flush down the loo.